Healing Two Communities, Part 1: White Supremacists — Truth or Fiction? July 14/10 - Six Nations newspaper Tekawennake op-ed series by Doug Fleming, Merlyn Kinrade, Gary McHale & Mark Vandermaas: 'Healing Two Communities, Part 1: White Supremacists -- Fact or Fiction?' Click to enlarge. Part 1, ‘White Supremacists – Truth or Fiction?,‘ addresses the attempts to falsely paint non-native activists as racist white supremacists and is reprinted here. Part 2, ‘What Now?‘ will appear in the Teka next week. It will offer specific suggestions for healing the relationship between Caledonia and Six Nations. Healing Two Communities: White Supremacists – Truth or Fiction? 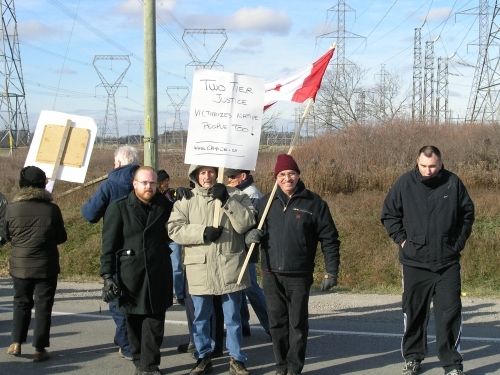 Some supporters of the occupations in Haldimand County have tried to portray Caledonia residents and non-native activists – especially Gary McHale and his supporters – as being racist, anti-native, white supremacists. In the beginning, it was an effective tactic. After all, which journalist, politician or community leader wants to take the chance of being associated with people who hold racist views? While this tactic was effective it also had the effect of causing Six Nations protesters to lose sight of their own message and instead focus on attacking the character of other people. The mainstream media and the public are now beginning to understand that they have been lied to. This is because – and what is never mentioned by our critics – we have completely rejected the ideology of racism, hate and supremacy, and even our harshest critics have been forced to admit that they have no evidence that we are members, supporters or associates of white supremacist groups. When Gary McHale and Mark Vandermaas were invited to speak at the recent ‘New Directions in Aboriginal Policy’ forum at Mount Royal University in Calgary they had an opportunity to listen to Wes Elliott present his message of Six Nation Sovereignty and his plan for peace, respect and love. Both McHale and Vandermaas interacted with Mr. Elliott in a respectful way. Not only have we completely rejected the ideology of racism, hate and supremacy, but neo-nazis have not been seen in Caledonia for more than three years. 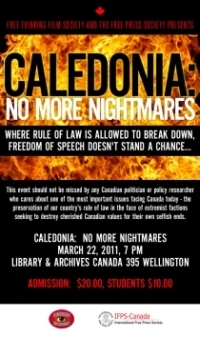 Our accusers conveniently ignore the fact that neo-nazis appeared in Caledonia before Gary McHale ever became involved. 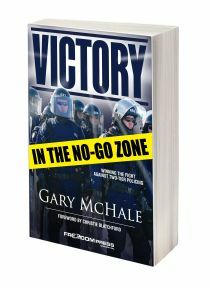 It was not Gary McHale and CANACE who attracted white supremacists to Caledonia, it was the lawlessness of certain native protesters and the lack of police response that attracted them – perhaps thinking they would find fertile ground for spreading their hate. We believe they stopped coming to Caledonia not only because we and the community rejected their repugnant ideology, but also because they rejected ours – our commitment to achieving equality, not superiority. What white supremacist would want to associate with people like us who quote and follow the teachings of Martin Luther King Jr.? Who reject supremacy in favour of equality and respect for all human beings irrespective of race, religion or grievance? Would you want to be part of a movement that ridiculed the KKK and compared them to masked native protesters? Would you follow people who held signs pointing out that native people are also victims of two tier justice – as CANACE founders Mark Vandermaas and Merlyn Kinrade have done? It has been especially hurtful to Merlyn Kinrade to be accused of being a racist. In his younger days, when he owned the Riverview Dairy, he coached hockey and baseball teams, and made a special effort to include needy children from Six Nations by providing transportation to and from practices and games, purchasing skates and other equipment for them and ensuring they were well fed during their time with the team. As with the now-deceased Judge Marshall – himself an honorary chief of Six Nations – Kinrade’s kindness towards the community was conveniently forgotten in favour of vilification. We have tried to reach out to Six Nations for help in the past, but the ‘white supremacist’ label made that goal an impossible task. For example, where was the media coverage when Vandermaas publicly spoke out about natives being victims, or when McHale condemned the media for their failure to report the problems of Residential Schools? Both these speeches were given on Oct. 8, 2007 outside the Lion’s Hall in Caledonia, but not one media outlet chose to report their messages. Hopefully, as more people discover the truth, it will become possible for us to work with people of good will from Six Nations in order to help find a realistic path to healing the two communities. Our next article will offer some suggestions to make this possible. A typographical error was made in the published version versus the ‘as-submitted’ copy shown above. 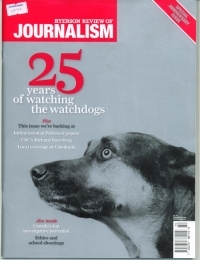 Click on the graphic at top right for ‘as published’ version. Mark Vandermaas was an original founder of CANACE. 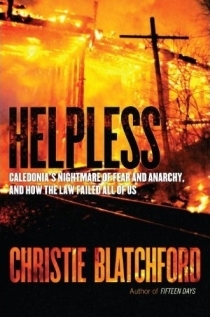 He left in Feb 2010 to found the Caledonia Victims Project. 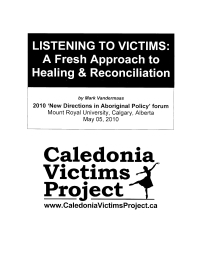 Caledonia Victims Project, July 26/10: Healing Two Communities, Part 2: What Now? This entry was posted in Caledonia Lawsuits & Court Actions, Doug Fleming, Gary McHale, Merlyn Kinrade and tagged gary mchale, Mark Vandermaas, Six Nations, Teka newspaper, Tekawennake, white supremacist, White Supremacists. Bookmark the permalink.